We’re excited to welcome the return of longer days and warmer weather with four new brew bar drinks: Bourbon Barrel Maple Cocktail, Vanilla Cherry Coffee Soda, Blood Orange Ginger Spritzer and London Fog. 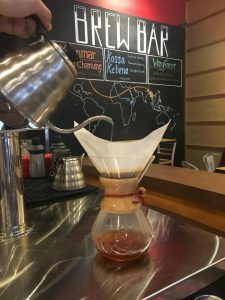 During Brew Bar Happy Hours from 12 p.m. to 2 p.m. Monday through Friday, customers can enjoy $1 off the regular price of these and other brew bar drinks at Crimson Cup Coffee Houses in Clintonville, Upper Arlington and Tallmadge, Ohio. “Our Ohio made Bourbon Barrel aged maple syrup was such a hit, we couldn’t part with it just yet!” said Regional Coffeehouse Manager Kim Popson. The drink sells for $4.50. Blood Orange Ginger Spritzer starts with award-winning Wayfarer Blend cold brew, slightly sweetened with blood orange and ginger simple syrups and topped with soda water. Served over ice in a 16-oz. cup, the drinks sells for $4.25. 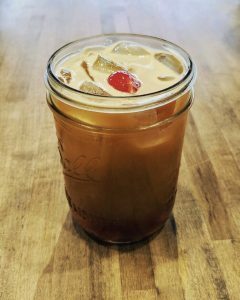 Vanilla Cherry Coffee Soda combines Ethiopian Nitro cold brew with cherries, vanilla and soda water. Served over ice in a 16-oz. cup, the drink sells for $4.25. For tea lovers, London Fog combines Earl Gray Lavender hot tea with a touch of vanilla and perfectly foamed milk. A 16-oz. drink sells for $4.00. In addition to the new drinks, we continue to offer fan-favorite Maple Cinnamon Latte, which combines local Ohio maple syrup and fresh cinnamon with its award-winning Wayfarer Blend espresso. A 10-ounce serving costs $4.25. 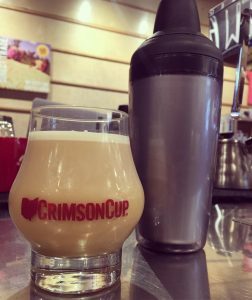 Ohio coffee lovers can experience these limited-edition drinks, while supplies last, at Crimson Cup Coffee Houses at 4541 North High Street in Clintonville, 2468 Northwest Boulevard in Upper Arlington and 116 Tallmadge Circle in Tallmadge, Ohio. During Brew Bar Happy Hour from 12 p.m. to 2 p.m. Monday through Friday, all drinks made at the brew bar are $1 off. Enjoy!